A vast majority of legal claims that arise from accidents and injuries often do not reach a civil court trial. Generally, they are resolved with a negotiated settlement between the parties far before the case makes it to trial in the litigation process. There is also the possibility for an informal settlement before any lawsuit is filed. In a settlement, the person filing the lawsuit (the plaintiff) agrees to renounce any pursuit of further legal action regarding the incident in exchange for monetary compensation. The payment is an agreed-upon, established amount of money coming from the defendant or the insurance company. Further, in rare instances, cases can be settled when the defendant agrees to cease certain actions. Speaking with an attorney before pursuing a settlement is the best way to determine if your case and legal claim has potential to be settled. If you have received an offer for settlement from the opposing side, it is wise to get legal direction before agreeing to anything. If you have experienced an accident or injury, consider discussing the following points regarding your circumstance with your lawyer. Discuss past jury verdicts and outcomes of settlements in other similar cases. Difficulties that may arise from trying the case. Your actual chance of winning at trial. Strengths and weaknesses in both your and your opponent’s evidence. The minimum amount of money you will accept in order to avoid trial and end the case. The policy limits of the defendant’s insurance coverage. The dollar amount range that your attorney thinks you could receive in damages at trial. 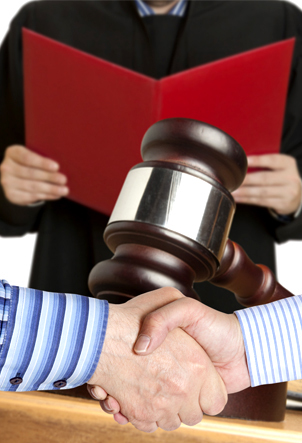 How much of the settlement proceeds will be applied to your lawyer’s fee and legal expenses. In regards to the majority of personal injury cases, the lawyer is generally paid with contingency fees. This means that you are not responsible for the attorney’s fee unless you receive a settlement in your favor, or are successful at trial. Consider a partial settlement, which would mean that you settle the easy issues first while working out negotiations for the more difficult ones. Decide what you would be willing to give up in order to get a case settled, as there is always a give and take for both the plaintiff and defendant during negotiation that both sides will accept. The ways in which settlement proceeds will affect both your federal and state income taxes. Keep in mind that a degree of personal information could be revealed at trial that may be uncomfortable. In most cases, civil court cases are open to the public, which allows for media scrutiny and potentially unfavorable publicity. Depending on your case, there is the possibility for disclosure of trade secrets and business information. Consider the estimated length of the trial. Discuss the extent to which your attorney believes the opponent will play “hardwill” - in other words, unwilling to negotiate.